Learn the ins and outs of getting your pond going for the season! Seminar may include outdoor demonstrations, weather permitting. A fun and informative workshop! Kids aged 5-10 get to create and take home their own mini pond and learn about pond ecology. There will also be a wetland tour! Registration fee is $35.00 per pond to cover the cost of supplies. A limited number of spaces are available. Please register before June 5. Valerie Williams – “The Snake Lady”, will bring an exciting collection of reptiles and amphibians for everyone to enjoy! Ask questions and have fun with friends at this educational and informative experience! Our biggest sale of the year. Everything will be on sale. 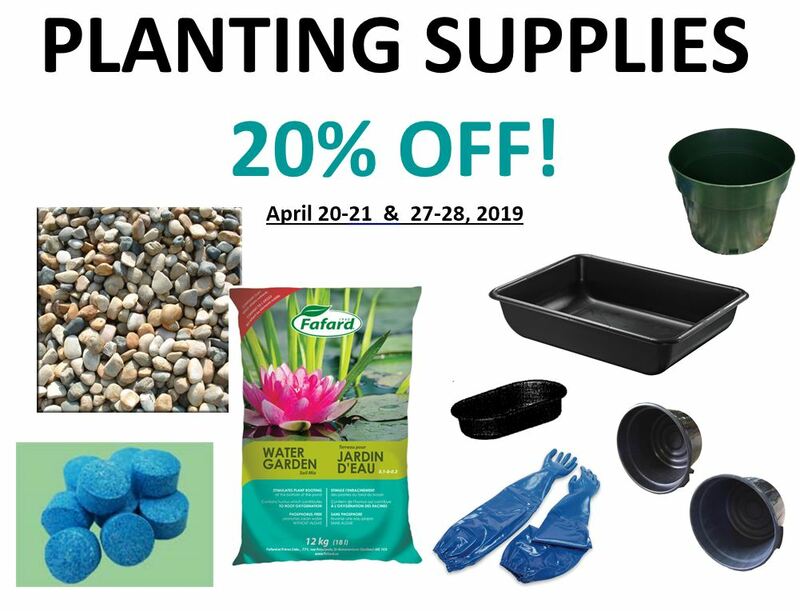 All Plants, All Hardware, All Fish and EPDM Pond liner will be on sale. Sign-up to tour local Port Stanley ponds at your own pace. A few select ponds will be showcased! Pond owners will be available to answer your questions.Charge is $5.00 per person which will be donated to the Matt Mailing Centre for Translational Transplant Studies at London Health Sciences Centre. Learn the basics pf preparing your pond fish and plants for the winter season. An informative discussion with a Q&A period following.